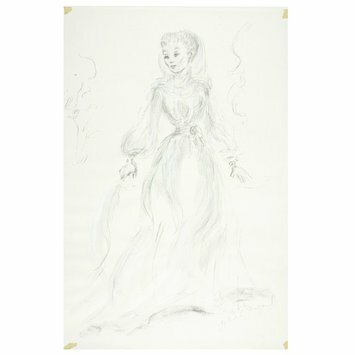 Great Britain’s leading theatre designer from the early 1930s to the mid 1950s, Oliver Messel (1904-1978) won international acclaim for his lavish, painterly and poetic designs informed by period styles. His work spans ballet, drama, film, musical, opera and revue. Messel’s traditional style of theatre design became unfashionable from the mid 1950s onwards, and he increasingly concentrated on painting, interior and textile design, including designing luxury homes in the Caribbean. Messel designed costumes and sets for Joseph L. Mankiewicz’s film adaptation of Tennessee Williams's play Suddenly Last Summer (1959). The disturbing story about the mystery surrounding the death of Sebastian, the poet son of the rich, eccentric Mrs. Venable, gave Messel the opportunity to create a fantastic, exotic garden which contributed to the dark atmosphere of the film. It starred Elizabeth Taylor, Katharine Hepburn and Montgomery Clift, and was nominated for several Oscars, including two Oscars for Messel’s set designs. Katharine Hepburn (1907-2003) played Mrs. Venable, an eccentric rich widow who plans to fund a hospital building for a state asylum if Dr. Cukrowicz will perform a lobotomy on her niece Catherine, who she wishes to silence. Costume design by Oliver Messel for Katharine Hepburn in a film production of Suddenly Last Summer, 1959. Artist's signature in pencil on the bottom right hand corner on the front of the sheet. Suddenly Last Summer, a film directed by Joseph L. Mankiewicz with a screenplay by Gore Vidal from a play (1959) by Tennessee Williams. It featured Montgomery Clift as Dr. Cukrowicz, Katharine Hepburn as Violet Venable and Elizabeth Taylor as Catherine Holly. Messel was nominated for two Oscars for his set designs. Lord Snowdon, Oliver Messel's nephew, inherited Messel's theatre designs and other designs and artefacts. The designs were briefly stored in a disused chapel in Kensington Palace before being housed at the V&A from 1981 on indefinite loan. The V&A Theatre Museum purchased the Oliver Messel collection from Lord Snowdon in 2005. 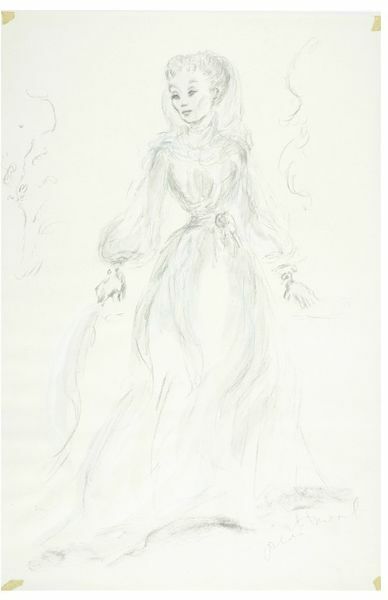 Costume design for Katharine Hepburn as Violet Venable by Oliver Messel for the film of Tennessee Williams's Suddenly Last Summer, 1959. Pinkham, Roger (ed.) 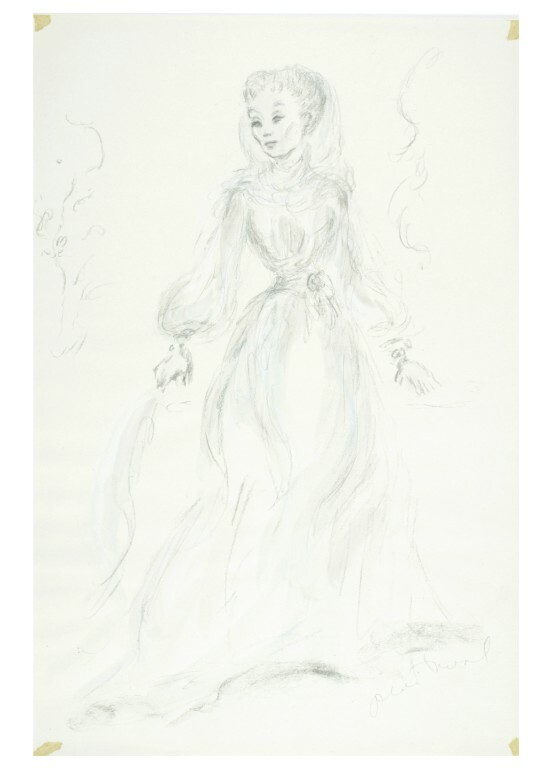 Oliver Messel: an exhibition held at the Theatre Museum, Victoria and Albert Museum, 22 June - 30 September 1983.